Three Weeks is Big Stuff! We have also redeemed the time by finding out all of the many things that rhyme with Blaire. Daddy flies her over the heads of the other kids and sings “Super Blaire… Flying high up in the super air…. gonna come right over there…. so someone can kiss her hair…” The kids of course cannot get over the funniness of this game. God seems to have prepared Blaire for this role in the family – she smiles the most during these games, like she knows just how she fits into this silly group of children. And while life has gotten a little busier, it has gotten a whole lot better. Not only do we have a sweet new friend, but I am not pregnant anymore! Also, I find that I can really save time by not snapping the middle snap on the onesie! 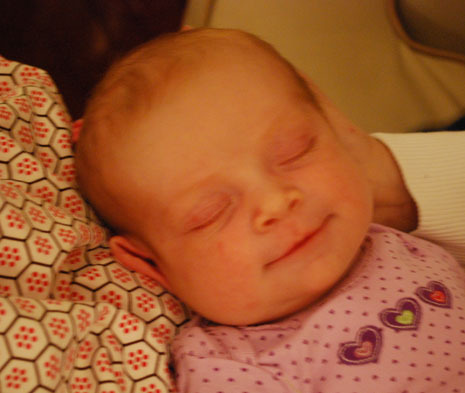 She is just adorable, and I love those goofy newborn smiles! Congratulations on another beautiful baby. She is so beautiful! What fun! Sweet moment’s hmmmmm… I have 10 weeks to go, give or take a week, and this is a reminder of the sweet gift that is coming our way. I have been told by friends that #5 has a special mellow sweetness to it. I am looking forward to it. Some days you just snap the middle one–when the onesie isn’t the main course of course! Her smile is so sweet. Bless you Rachel. Ha! That’s funny, because sometimes I only snap the middle snap on the onsie! she looks very sweet!!! Next baby you’ll only snap the middle onesie!! And as an aside I have always wondered how you got Lizzie from Rachel…middle name? Precious!!! We are putting our 9 month old girlie in those same sweet purple onesies…and (like Jodi) if I am really on the move will only snap the middle snap! What a delight, those little girls. Rachel’s middle name is Elizabeth. We sometimes just refer to her as the Liz. why do onsies have three snaps, anyway? She’s adorable, Rachel! She’s just beautiful, Rachel! Enjoy! It’s amazing the difference in the number of snaps on entire outfits. (I’m thinking newborn winter type stuff.) You know the ones with very few snaps were designed by people who’d had children. We want more pictures of Marisol, too. This gets me so terribly excited as I am 31 weeks pregnant with our fifth child. My other four ones are 6 and younger and already the anticipation is incredible. “is he kicking Mom?” “Do you think Soeren is hungry mom?”. I know it’s only going to get more fun! (and yes, I’m looking forward to not being pregnant!) Blaire is gorgeous, such a beautiful newborn!! Oh the time I could have saved by leaving that middle snap out! I’ll remember it this time around – I’ve got our fourth coming the end of August. Congratulations on the first 3 weeks- She’s super-pretty! Hence why the baby outfits with zippers are a great addition to any mom’s repertoire of infant clothing! Don’t snap the middle snap..what a hot tip! right ear…… She is precious. You’ll have to blame Nana for that one. It is just her hand under the blanket, folding Blaire’s ear up on itself! It’s delightful reading about how much fun you are having with all your little people. She is lovely (!) and very blessed to be a 5th child. In our family it worked out that each child after the 4th (we have 7) got extra special love from the siblings. The babies all seem to just know that he/she was extra-specially loved. I think it had to do with siblings old enough to appreciate them and having enough siblings for the over-the-top-love to be contagious. By the way, I’ve always found that vacuuming takes on a whole new level of excitement after the baby is born. I just feel so ‘light’ in comparison to just prior to delivery that vacuuming (the whole house, even) seems a sheer joy. Weird, I know. This beautiful post just makes me want to hold another baby of mine! She has been beautifuly woven! Congratulations!